One of the peculiarities of cycling with a family, particularly over significant distances, is the array of peculiar and bespoke kit you end up using. With the size of children being an ever-changing feast, one year's solution may well not be the next, and when you have multiple children, different pieces of kit go from irrelevant to indispensable and back on a seemingly reciprocal basis. Having first been used seven years ago, our trailer is potentially about to drop out of use again and we joke that maybe we should have another child so we don't have to deal with saying goodbye to the trailer! Watch out for an article soon about the different ways to tow your children. It's also the case now that our growing family cannot afford to lose load capacity, which for us is more about volume than weight. As Ruth and Rhoda have grown, we need fewer nappies but a bigger tent. Their clothes take up that bit more space, although they need fewer spare sets. They weigh more, but are almost ready to start carrying some of their own weight. It's a moving feast. With the trailer leaving our touring setup imminently, we needed options to claw back some capacity. 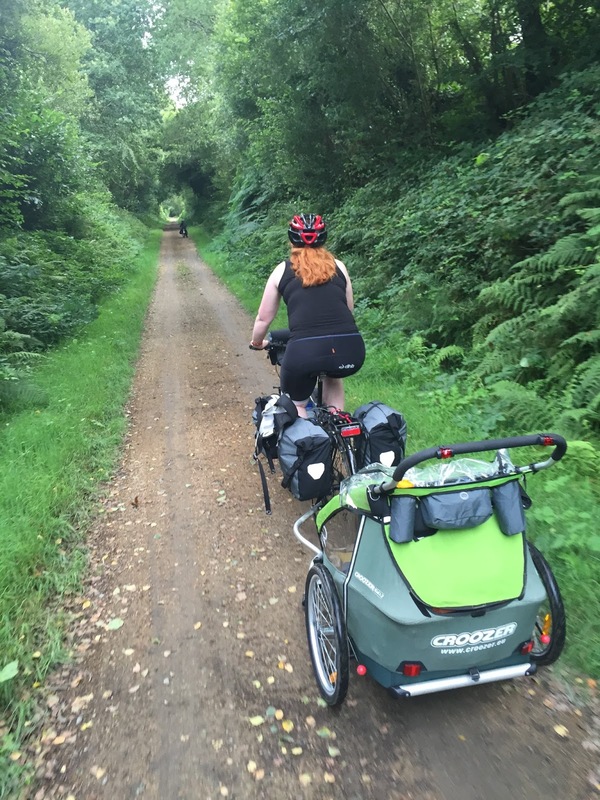 Now that Ruth is riding by herself, one tool that is about to come back into play after a few years off is the trailerbike, with which we last rode in 2014 when we traversed the Outer Hebrides - Thomas Ivor's first proper tour. That first trailerbike, a Trek Mountain Train which we bought off eBay for just £34, did us sterling service, but there's no escaping the significant weight and ungainliness of the thing. We had one of two problems with it of late, particularly the occasion when the folding arm's hinge bolt undid itself and the arm fell off the back of the car - mercifully at low speed in a town with no damage done. Unfortunately, the bolt, which has a rare locking head, was lost; Trek no longer stock the parts. It's been sat gathering dust in the basement for a while, and I couldn't help but feel it was a little more agricultural than the rest of our kit. 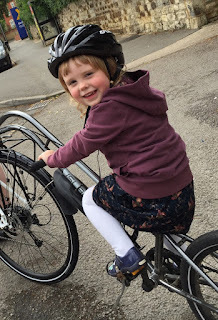 When one of the old Islabikes trailerbikes turned up for a reasonable price on the excellent Facebook group, I decided to go for it, with an eye on Ruth's next move. The weight difference is significant, and best of all it mounts to the adult's bike using a bespoke rear rack, rather than the seatpost. Our frustration at the small gauge of the rack (requiring adjustment to our Ortlieb panniers' clips to take up the slack, meaning our fronts no longer fit on the rear for short trips) was more than tempered by the stability of the setup, and the adjustable handlebars, which meant we got Ruth riding straight away, to our surprise. It was then that progress came to a grinding halt, when our touring bikes (and crucially, that special, not-made-any-more rear rack) were stolen off the back of our car. 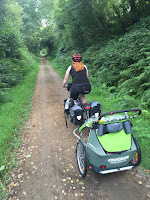 The chances of us obtaining a replacement rack were slim-to-none - but first impressions of the trailerbike had been so strong we weren't going to give it up that easily. Only a couple of days later, the children and I waited at the station for Mummy to arrive home having been to the south coast and back after work, on the all stations stopping train, to fetch another identical trailerbike, which was being sold with two racks. We were back to two bikes and two racks, even though it would be a while before we would use them all. I'm so glad we did. Soon I discovered that for short trips and day rides, I could hitch the trailer to the back of the trailerbike, and we were mobile as a three-up combo. I will admit, it's like trying to fly a freight train when hills are involved, but on railway path, it worked a treat. Ruth got to ride, and if ever she tired, she could jump in the trailer. As it happened, the threat of the latter always caused her to dig deep and keep riding! Coming soon: How we rebuilt our Islabikes trailer bikes for touring with the littlest people!